Puntland has successfully held its fifth presidential election and a new president and vice president were elected on 8th January, 2019. Said Abdullah Deni, a successful businessman and former federal planning minister, was elected president, while former minister Ahmed Elmi Osman was elected as vice president. Garowe was bustling during the election season as many people from other cities and abroad came to campaign for their respected candidates. The restaurants, café houses, and shopping centers greatly benefited from the election fever. All the hotels were booked and even the houses were used as inns to accommodate the influx of people. This election was different from the previews ones as it looked as though it was one-person one vote event. The candidates toured in most of the regions and received a warm welcome in every city they visited. The top presidential candidates also, for the first time, presented their written political manifesto to the public so the citizen can hold them to account. The youth played an integral part in this election as they were campaigning for their candidates on social media. The youth have shown that they are ready to actively participate in the political process. Civil society groups have actively engaged with traditional elders to select/elect MPs based on integrity and not to choose based on money. They have also called for holding free and fair election. Traditional elders met with vetting committee to ensure the process to be fair and transparent. The candidates for state parliament spent thousands of dollars to get elected and presidential candidates spent millions of dollars in campaigning, making this election the most expensive one in Puntland’s history. On the night of the election, a huge amount of money change hands as many MPs took bribes from different candidates. Even though many MPs took a chunk of money, corruption was not the only determining factor for victory because the candidates who paid most of the money lost in the first round of the election. Surprisingly, the incumbent, former President Abdiweli Gaas, sought reelection only to lose in the first round. His defeat reinforced the notion that Somali incumbents never win a second term. The federal government backed a candidate who had the distinction of spending millions of dollars—the most in the campaign—but strangely exited in the first round. 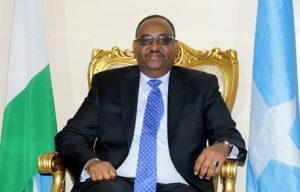 This candidate was rebuffed by the MPs as he was seen as a liability due to his dubious connections with Mogadishu. The new president is inheriting worsening security and crippling economy from his predecessor. The security situation in Bosaaso has been deteriorating for the last one year. Al-Shabab used to carry out targeted assasnations in the past and now ISIS started a similar terror campaign. ISIS and Al-Shabab take extortion money from business people in Bosaaso and those who refuse are killed. The two terror groups have bases in the Bari Region and pose an existential threat to the people and the government of Puntland and they ought to be dealt urgently. The new president needs to re-organize security forces that were neglected by successive governments. The security forces are still clan-based and need to be overhauled into national forces. They should get training, equipment and regular salaries so they can efficiently do their duties of safeguarding Puntland. The president needs to instill new blood in the bureaucracy – with commitment to integrity and diligence. The previous parliament disbanded the Civil Service Commission—a hotbed for incompetence, corruption and favoritism—and appoint a a body with competent, honest, and fair-minded members. President Deni should also improve public financial management and curb rampant corruption, mediocrity and favoritism that were the hallmark of the past regimes. He should develop new development projects as well complete outstanding projects, such as the Ceeldaahri-Ceerigaabo road, Garowe-Galkacayo road, which stopped due to corruption, and finally the Garacad Port. 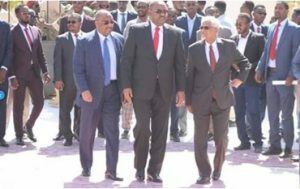 The relationship between the federal government and Puntland was not good and Deni should work with Mogadishu on finding a viable solution for ending the ongoing spat. He should de-escalate political confrontations between Puntland and the federal government and enhance collaboration; a working relationship based on respecting the constitution. The clan-based election system has proved to be disastrous because it always leads to polarization, animosity between clans, and the emergence a new crop of elders bent on carving their own niche. The new president must start democratization process in his first year and not wait until the last years of his term as his predecessors did. The president should set a timeline for his seven goals that he pledged during his campaign and prioritize its implementation. Finally, I would advise the new president to avoid any interest group that want to hijack his government and tarnish his image. The president has a five-year term and probably he will not get re-elected for a second term and therefore he should focus on leaving a remarkable, memorable legacy. The nagging question is whether the new president will honor his campaign pledges or renege and, hence, follow the footsteps of previous regimes, which were notorious for corruption, nepotism, favoritism and unfulfilled promises. Only Time will tell!